PELHAM, AL – Needing a spark to keep position late in the season, that Marksmen went into Birmingham with a plan. Fayetteville needed to win to still be in contention for fourth place, meaning they wouldn’t be in the pool for the challenger round. The game started off quick, but not in favor of the Marksmen. Birmingham came down the ice and only 44 seconds into the game, they scored the opening goal of the game. After the flurry in the opening minute of the game, the scoring and offense slowed down. Fayetteville was able to string a few shots together, but failed to find the net. The woes in scoring went for the Bulls too as they failed to find the net after their opening minute goal. Penalties stayed low, as only three penalties happened in the opening period. Exactly 13 minutes after their first goal, Birmingham struck again. They scored their second goal of the game, giving the Bulls a 2-0 lead. 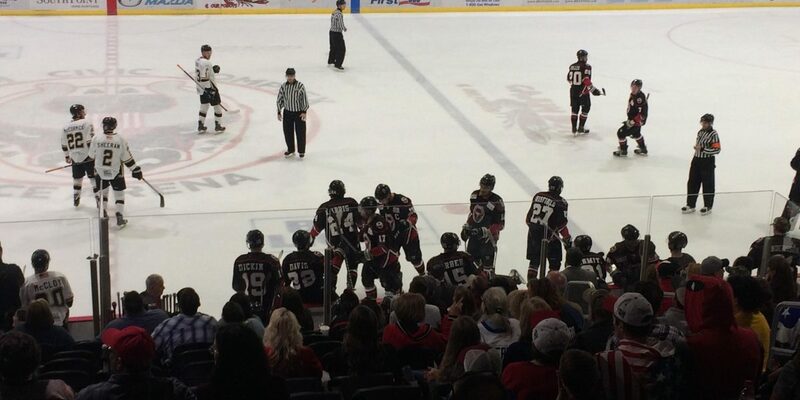 The period ended without anything else important happening, sending the teams to intermission, Birmingham leading 2-0. Fayetteville didn’t want the game getting away from them, needing a few goals to stay in it. Birmingham didn’t let Fayetteville stay in it, as they scored right out of the gate yet again. This time, it took them 87 seconds; but they still found the net, extending their lead to three. Fayetteville needed to string some offense together if they wanted a chance in this game, that chance never came. With 13 minutes left in the period, Birmingham found the net yet again. The Bulls scored, extending their lead to four. A few penalties late in the period slowed it down, but that didn’t affect the Bulls. They scored yet again, effectively putting the final nail in the Marksmen coffin. Birmingham scored with only 29 seconds left in the period. The second period ended and the Marksmen were in a big hole, 5-0 with 20 minutes still to play. The third period of the game was emphasized by penalties. Both teams more than tripled their penalty minutes in the third period. Although the penalties loomed large, scoring didn’t come along with it. The teams combined for only 11 shots on goal in the final period, compared to 47 penalty minutes. The clock struck zero, the horn sounded, and the game was finally over for Fayetteville. The Marksmen lost 5-0 to the Bulls on Friday, their third straight loss. The loss drops them to 24-21-8, putting them in a three way tie for sixth. Even with the loss, the Marksmen are still only two points away from sole position of fifth. Only three games remain in the regular season for Fayetteville, every point is even more important now that fifth-eighth is only one point apart. The Marksmen have clinched a spot in the SPHL Post-Season for the first time in Team History! Keep up to date with playoff-seeding and game schedules on the Marksmen Media Network across our social media platforms.